A change in outcome requires a change in actions. There are several actions that cause your teeth to yellow. 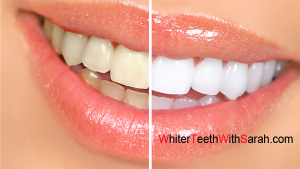 If you are willing to change those actions, you prevent the teeth from becoming yellow and whiten them naturally. Remember that just like brushing, it doesn’t matter how diligent you floss and brush, you still need to visit your dentist on regular basis. Your dental hygiene habits may extend the time you need between visits and make the visit more pleasant. Brush after eating and drinking. Just like a white dress or a white shirt stained with coffee or juice, how fast you get the stain off determines how much of it you can effectively remove. If you drink a lot of coffee or smoke, brushing after each drink or smoke may not be practical. It will pay off if you reduce your intake and look at nutritional imbalances that contribute to your cravings and your health. A combination of carbamide peroxide or hydrogen peroxide and baking soda has been used for years to whiten your teeth. An added benefit is the anti-bacterial effects of hydrogen peroxide that could improve the overall health of your mouth. Baking soda is gritty, it can at as a sandpaper. Mixing things at home may not be a good idea. Make sure to get your dentists clearance and use an ADA-approved whitening toothpaste. Try Coconut Oil Pulling – Oil pulling is an ancient Ayurveda practice. You swish coconut oil around in your mouth just like a mouthwash for 5 to 20 minutes and then spit it out. Those who use this technique report other health benefits beyond whiter teeth. Use Orange Peels – CBS radio reported on how orange peel could act as a natural tooth whitener. You peel the orange and rub the white stuff on your teeth.